Back in May, Erin from Brooklyn Pattern Company asked me to test one of her brand new patterns and I was over the moon with excitement. The dress perfectly balances modernity and tradition; femininity and fun. I cannot wait to finally share the photos of the wonderful Henry dress with you all! Knowing I was sewing the dress for 8 year-old J (a family friend and the best model I could ask for!) I had to go out and splurge on some gorgeous bright fabrics to suit her personality. I chose these brilliant contrasting turquoise polka-dot and orange stripe cottons from Hobbycraft that I knew she’d just love! The polka-dots even inspired their own Throwback Thursday blogpost which you can find here. The dress features beautiful gathered and pleated sleeves which add the perfect amount of girliness to this dress. 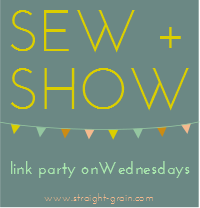 Plus, for those of you (like me) who dread sewing sleeves, there’s no need to fret! Erin cleverly breaks the process into two installments making it SO much more bearable! The dress also features some pretty awesome pockets; perfect for any little girl who loves exploring and collecting treasures along her travels! I had such a great time photographing J! It had been raining constantly all morning but as soon as she put on the dress the sun came out and shone down over our photoshoot in my parent’s back garden. J couldn’t stop grinning and was literally jumping with excitement. The Henry dress allows a lot of movement, so jumping as well as running, rolling, climbing and dancing was no problem at all! It’s safe to say the dress was a winner! If you would like to sew your very own Henry dress, or any of Brooklyn Pattern Company’s other designs (I can’t wait to give the Bedford dress a go! ), Erin is offering readers of the Henry & Bedford Blog Tour a 20% discount on any pattern in her shop with the code: SUMMERFUN15. The code is valid now until 15th July (11:59pm EDT), so get on it folks! My British Summer Holiday Dress! My Top Ten Online Sources for Vintage Inspiration! I love this dress — especially the sleeves! Such a gorgeous model, and I love the colors you used!